Skill Matrix is a chart or a database where operator’s past performances on various operations are recorded in a systematic way for the future reference. In a skill matrix operator performance is recorded in efficiency percentage. 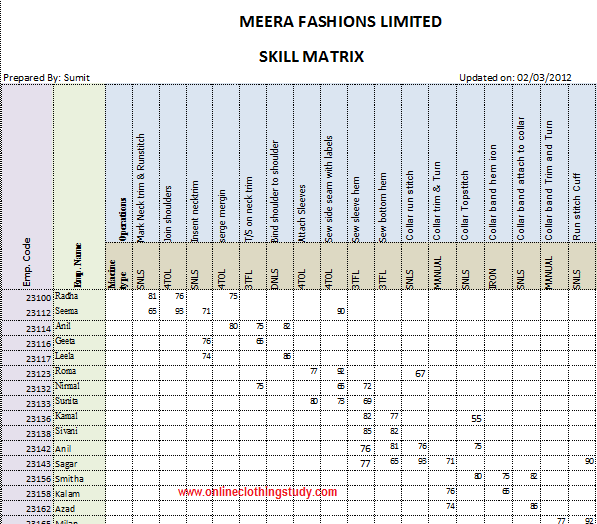 Skill matrix is also called as skill inventory of the operators. A basic skill matrix is shown in Figure-1. (Click on the picture for zoom). Skill matrix is updated on a regular interval. Or after completion of each style operator's current performance (efficiency%) updated on the database (for manually developed skill matrix). The benefits of an operator skill matrix are enlisted below. It keeps record of all operations an operator had done in the past and efficiency level in each operation. Engineers / line supervisors need minimum time to find and select most efficient operators for an operation from the pull of operators. For line balancing, operators can be selected according to work content. For example – where an operation is required 50% less time than pitch time, engineers can select an operator whose efficiency level is 50% on that operation. When operation clubbing is required (for less work content works), skill matrix gives the information what all operation to be given to an operator. When someone is absent, supervisor can easily find suitable person from the skill matrix table and replace. 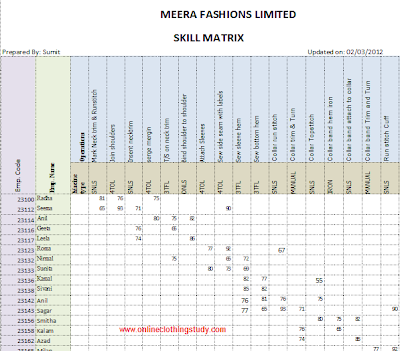 A skill matrix can be made in spread sheet. Or real time shop floor data tracking system can be used for skill matrix development. In the skill matrix, an user can do sorting of operator performance in various operation and other way in a operation how many operator are there who had earlier worked on and their efficiency level. How to balance a line using skill history? Online Clothing Study: What is skill Matrix for Sewing Operator?